A healthy baby's diet - Mummy's Gone Mad! | Mummy's Gone Mad! Choosing a healthy diet is very important for the mental and physical growth of a baby during the first year of its life. Choices start at birth when the mothers and fathers need to decide on whether to breast- or bottle-feed their baby. Due to the rapid physical maturation of the infant, there are many which will be raised regarding the first-year dietary considerations for babies. It is very important that you always consult with your pediatrician before changing your baby’s diet. After the baby is born, the baby’s only source of nutrition is either breast milk or formula. Each of these nutrition sources has its pros and cons. Breast-feeding your baby will bond mother and baby quickly and will provide immunity to illness from the mother’s milk. Breast feeding is also free and rather convenient as well. Breast feeding you little one also means that the father or other family members cannot help with feedings. Parents who choose to bottle-feed their baby must decide on which formula is best for their baby. There are many different types, but the three main types of baby formulas come from soy, cow’s milk, or hypoallergenic protein blends. It is normally between 4 and 6 months that the baby becomes ready for baby cereal to supplement the chosen milk or formula. 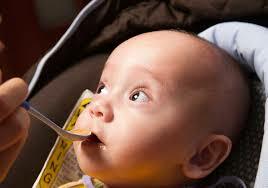 Check with your pediatrician before introducing solids to your baby. Sitting on their own, supporting and gaining head control, and becoming interested in foods are all signs that they may well be ready to start with solids. Always start with a single-grain baby cereal and mix it with a little formula or breast milk. A few teaspoons of cereal are enough to start off with. If your baby tolerates the cereal, you can try adding one pureed vegetable or fruit at meal time. Wait for a few days before you try to introduce new foods so that you can see what they like and dislike. A healthy baby will drink a supplement of breast milk or formula throughout the entire day, but already know when meal times are by the time they reach about 6 to 8 months old. Your baby might be reaching for your plate by now to get their little hands on some more solid food. After being to your pediatrician and getting their blessing, a 6- to 8-month-old baby could be ready for a diet which includes finely chopped up soft foods. Small pieces of fruit and overcooked pasta are great for starting off with. Avoid pieces of hot dog and grapes, as they can cause your little one to choke. Crackers and foods that can be eaten by babies without teeth are healthy choices and they will keep your baby busy as well. The last three months of the first year will be a transitional period for baby’s meal times. Healthy babies might be able to drink from a cup and use a spoon by this age. Supplementing their solid foods with breast milk or formula normally continues until just past their first birthday. Fruit juice is acceptable, but keep it to a minimum, as juice can cause diarrhea in infants. If your baby is ready to eat meals with the family, be sure to finely chop the portions into small pieces and do not include any chewy pieces of meat.